'Consensus is that Sir Donald Bradman was the best batsman ever to play Cricket. Sir Don did not play One-Day Cricket but if he did, he could easily be Sachin Tendulkar.' ' Barry Richards. Bombay, the mecca of Indian cricket, the city which gave Gavaskar, Vengsarkar, Shastri and many more'.But the most important thing is that Bombay gave us Sachin Ramesh Tendulkar. 24th April 1973, wife of Marathi poet Ramesh Tendulkar gave birth to a child and named'.Sachin. The name itself strikes terror in the hearts of bowlers and captains all around the world. This man has all the shots in the book, and a few more developed by himself. He can be fit in team in any role - he opens the batting for India in the one-day Internationals, comes at no. 4 in test matches, bowls right arm off-breaks, leg-breaks and even googlies. He also swings the ball both ways when he bowls his medium pacers. He is one of the best fielder in Indian cricket team. It seems he had tried his hands at wicket-keeping too in his school days. In his schooldays Sachin joined the nets of Dronacharya Ramakant Acharekar. With his schoolmate Vinod Kambli of Shardashram he enjoyed his school level cricket. These two Shardashram batsmen added a mountain of 664 runs for the third wicket in a Harris Shield game in February 1988 at the Azad Maidan to create a new world partnership record for any wicket in any class of cricket. Kambli made 349 and skipper Tendulkar 326 as Shardashram hoisted a total of 748/2 before taking mercy on a wilting St. Xavier's High School attack. It was then that he was picked up by eyes of selectors of Mumbai Cricket team. Tendulkar made them proud with his unique debut in domestic cricket. He remains the only player to score a century on debut in all three domestic first class competitions: 100 not out in the Ranji Trophy (Bombay v Gujarat at Bombay 1988-89), 159 in the Duleep Trophy (West Zone v East Zone at Guwahati 1990-91) and 103 not out in the Irani Trophy (Rest of India v Delhi at Bombay, 1989-90). The wonder boy made his international debut in ODIs and Tests at the age of 16 against traditional opponent Pakistan and the fiery pace of Wasim Akram and Waqar Younis. Tendulkar became the youngest batsman to score a Test half century when he made 59 against Pakistan at Faisalabad on November 24 1989. He also became the youngest man to score 1000 runs in Tests - at 19 years and 217 days - during his fourth Test century at Johannesburg in 1992/93. 'You might pitch a ball on the off stump and think you have bowled a good ball and he walks across and hits it for two behind midwicket. His bat looks so heavy but he just waves it around like it's a toothpick.' ' Brett Lee, on Sachin Tendulkar's batting. In batting, he has reached a stage that others can only dream of. He has hammered every bowling opposition in the world - from Shane Warne (Aus.) to Saqlain Mushtaq (Pak. ), and Waqar Younis (Pak.) to Allan Donald (RSA), and in style. This saga continues as master-blaster made the highest runs in a single calendar year in ODIs in 1998, amassing 1894 in 34 games at an average of 65.31, including nine hundreds and seven fifties. Tendulkar broke his own world record of 1611 runs set in 1996. He also crossed 1000 runs in three other years 1994, 1997 and 2000. At Indore against Australia on March 31 2001, Tendulkar drove Shane Warne for a single to long-off and went down as the first man to scale the summit of 10,000 runs in ODIs. Sachin Tendulkar reached another milestone during the third day of the second Test against Zimbabwe at the Harare Sports Club when he struck Arnoldus Blignaut for his third boundary to move from 18 to 22, Tendulkar surpassed Dilip Vengsarkar's tally of 6868 runs to become India's second highest Test run getter. The highlight of the Queen's Park Oval at Port of Spain in Trinidad, 2002, test play had been Tendulkar scoring his 29th Test century to equal Sir Donald Bradman's record of Test hundreds. The young maestro now has only Sunil Gavaskar ahead of him with 34 Test hundreds. 'Beneath the helmet, under that unruly curly hair, inside the cranium, there is something we don't know, something beyond scientific measure. Something that allows him to soar, to roam a territory of sport that, forget us, even those who are gifted enough to play alongside him cannot even fathom. When he goes out to bat, people switch on their television sets and switch off their lives'. 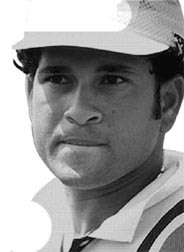 Mentally very strong, Tendulkar was appointed as the captain of the Indian side in 1996-97 making him the second youngest captain in the history of Indian cricket. He initially justified the confidence put in him by leading India to series victories against Australia South Africa (at home) and also lifted the TITAN cup. But after that he was not given the squad that he wanted and India started losing under an unhappy, helpless captain. As per Indian tradition, the skipper was made the scapegoat and citing his lack of form (? he had more than a thousand runs in his bag in 1997) was removed from captaincy. After becoming Captain during two short stints, Tendulkar has made it clear that he would prefer to concentrate on his batting and since then, he has flourished with both the bat and the ball. At age of 29, this master blaster is climbing towards the throne of highest run getter. He has already gathered rich praise from people who see in him a living legend and god. 'His life seems to be a stillness in a frantic world... [When he goes out to bat], it is beyond chaos - it is a frantic appeal by a nation to one man. The people see him as a God... ' 'Mathew Hayden, on Sachin Tendulkar.
' I (Embarrassed laugh) am a normal person who plays cricket. I am nothing more than that' ' Sachin Tendulkar, on being told of above quote. Beyond doubt, a living legend and a great title holder.